Appliances and kitchen cabinets must work together to create a pleasing and functional kitchen design. 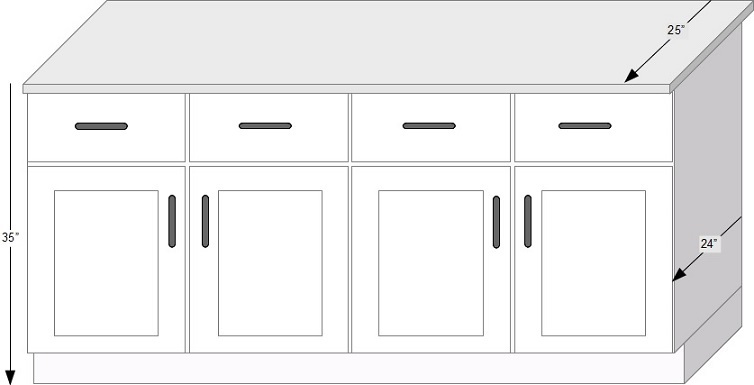 Base cabinets are almost always 34 inches tall (35 inches to counter-top height) and 24 inches deep. Most freestanding ovens, slide-in ovens and dishwashers are designed to work with 34 inch tall base cabinets. Wall cabinets are almost always 12 inches deep and height can vary, with most wall cabinets being either 30 or 39 inches tall. In some kitchens the ceiling height or soffit height can limit the height of wall cabinets to the shorter 30 inch height. With regard to appliances and wall cabinets, the relationship between the refrigerator and microwave oven are the most important. Ensure to select a refrigerator that will fit below an over-the-refrigerator wall cabinet and a microwave that will fit below an over-the-microwave wall cabinet.